Mobile apps are now here, there and everywhere, set to serve the best of requirements but the burning question that lies unanswered is ‘Are all these apps beneficial, applicable and appreciated to the highest possible extent of client retention and satisfaction?’ It is an observed proven fact that about a quarter of the client crowd, who open a mobile app for the first time, do not return to that app again. This is what does not let these mobile apps get customer friendly and finally end up with an untimely end. Examining various factors affecting the growth of the mobile app market, one thing is for sure: the very main parameter that is the crux of the success of the app is the Mobile App Design and how well it gels with the clients and how successfully is it able to deliver what exactly the client wants. There are many evident cases which showcase why the web design isn’t working. What is more important today, is to allure the client, be it prospective or existing within the shortest time possible, as, the moment you take more time, there are peers right there, waiting for the opportunity to be theirs. Hence, efficiency and pleasantness are a must in any UI design and hence the design has to be such. With its combination of creative + technical bent, user experience designing has a contemporary approach and surely has some tips and tricks to create a design that attracts increasing number of visitors. It is very important to showcase the value of your app instantly. With varied activities like engaging users to take care of their tasks, activating CTA right on time, highlighting the mobile app’s major features at the apt time, apt place so that they attract the client exactly when it should. It is highly significant how the menu is arranged; it needs to be exactly how the end user would like to see it as. Of course, there is a lot of mental study that is required but the art of User Experience Design involves this and hence caters to the psychology of the end user. One more area that is very important while navigating through the app is the Back criteria. It should be easily don’t, with a single click and not with a series of returns to the base. Another periphery of navigation is between the mobile app and the mobile web portal, which really needs to be flawless and quite self-explanatory. It is very obvious that when any new user enters the app, the very first thing to be shown is the Search bar, asking the user what exactly they are looking for. The app users really need an effective and useful app search in order to avail maximum benefits from the features of the app. Intelligently and accurately, the indexing also has to be performed keeping in mind what the user would be looking at, at that moment. Varied options like filtering, sorting have to be right there, so as to enable users hit their targets very much on time and with ease. At most times, your visitor could be a new one, could be an existing one or could be already your client. For converting visitor into clients, it is very important to provide them a seamless mobile app design experience as they move along the website. Provisions like easy searching, comparing products, fetching other user reviews for a particular product, listing self-purchased products to ease further shopping, offering multiple payment options and further to it, storing user’s last mode of payment and fetching those details so as to avoid duplicate entry all the time are all for making your visitor stick to your mobile app. The very first formal step that a visitor would take is to register. It is the foremost step to connect with the user and thereby ensure an easy conversion ratio, enhancing the client relationship further. But, though simple as it may look, there is a lot of care and caution that must be ensured while filling in the registration details. Firstly, registration should come into picture only when absolutely necessary else it may prove to be most unnecessary for the user. It is also very necessary that the user understands the basic difference between registering for the first time and signing in every time, while entering the system. Also, the password authentication / change password functionalities are also highly tiring if not handled with caution and perfection. 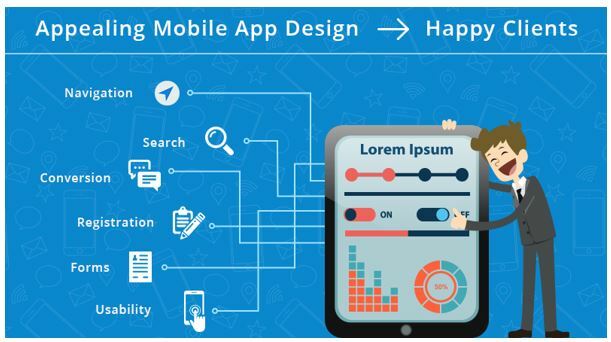 One of the most boring jobs that the user feels is entering information and hence though it is very important, the Mobile App Design should be such that it facilitates simplistic and to-the-point entry into the app, so that the user is not snatched of his interest into the app. Take care of performance, look and feel, content, security while designing the form. After all, it is the like and priority of your client, that is the basic purpose of creating the mobile app. Hence, the usability of the same is very vital. Once you and your client are on the same platform, more than half the battle is won. Visual effects, text labels, content, responsiveness, security permissions – all these parameters play their own significant roles in increasing the usability of any mobile app. SPEC INDIA, your IT partner, provides skilled, modern, attractive and visually enriched Mobile App Design Services, with over a decade of experience serving elite clientele all around the globe. Indulging into a vast variety of technologies to support a robust design framework, we look forward to understand our client dreams and put our best foot forward to transform them into a tangible reality. Request for a Free POC to test drive our services.